Rockets Director of Player Personnel Lorne Frey is in Calgary for Thursday's Western Hockey League bantam draft. Frey says he has decided on one of two players he will select with the Rockets second pick overall in round #1. Obviously I am not at liberty to say who those two players are, but Frey believes both will be impact players in 3 years time. That means at 17 they should be more than just a 4th line player - a Justin Keller type - who scored 25 goals as a seventeen year-old rookie. Frey says you can expect more American born players than ever before taken in this draft with the majority being selected in the later rounds. Portland Winter Hawks fans don't despair. Word out of Calgary - the site of the WHL bantam draft - has the Hawks still in the mix in persuading highly touted Luke Moffatt from signing a players contract with that team. Last week it was reported that Moffatt gave the Hawks the cold shoulder when he was approached by the team outlining their intentions on selecting him with the first pick overall. If the Hawks do pick Moffatt you can be guaranteed he'll quickly be in the Hawks lineup for a series of exhibition and regular season games. If Moffatt infact is struggling with the idea of major junior, it would be in the best interest of the team that draft's him to put him into game action right away, or in essence slamming the door shut on him venturing off to play U.S College hockey. As an underage player, WHL team's can play a 15 year-old in just 5 regular season games. WHL teams are busy these days talking to parents of players eligible for Thursday's draft. Team's obviously want a commitment from the parents that their kid will play in their organization if they are selected in the draft. Yet Lorne Frey tells me sometimes it's the parents who you don't make contact with that prove to be a help rather than a hindrance. Tyler Myers is a great example. The Rockets never talked to the kid because they didn't think he'd even be around when they pick him in the 1st round in 2005. Myers dad was so impressed that the Rockets just left the family alone that when he was picked to play in Kelowna, his dad had no hesitation in allowing his son to play in K-Town. I spoke to an Eastern WHL scout in Calgary about the chances of Luke Moffatt being the first player selected in Thursday's draft. He said, "Even Ray Charles could find this guy". That should tell you that Moffatt is the consensus #1 of players eligible. In an earlier blog I detailed the career of Brock Trotter, a Manitoba kid who was on the Rockets 50 man protected list who is now playing at the University of Denver. Frey told me that Trotter attended the Rockets training camp at 16, but in the best interest of the player the coaching staff at the time thought it would best if he played a year of hockey closer to home to develop and mature. I guess Trotter was in tears when the Rockets told him they didn't have room for him back then. He really wanted to play major junior! One year later the Rockets had room for Trotter but this time the tables were turned and it was the player-not the team that said no. Trotter went on to play in the Manitoba Junior Hockey League in Dauphin before playing in the U.S Hockey League. This past season he led the U of D in scoring. No wonder the Rockets have carried a significant number of 16 year-old on it's roster over the last couple of years. Had they done that with Trotter in 2002-2003, he'd be an overage with the hockey club this upcoming season. 2)Kevin Sundher, forward, Burnaby, B.C. 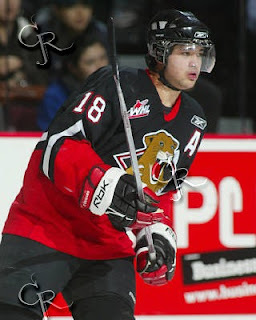 5) Alex Theriau, defenceman, Burnaby, B.C. 6) Connor Redmond, forward, Burnaby, B.C. Former Rocket Brent Howarth is off the Royal Bank Cup in Prince George. The 20 year-old and his Manitoba Hockey League Champion Selkirk Steelers beat the SJHL Champion Humboldt Broncos last night in the 4th overtime capturing the Anavet Cup in the 7th and deciding game. Last night's marathon game ended at 12:50 am local time. I listened to the Humboldt Broncos radio guy who had no color analyst at his side for the entire 5 and a half hour broadcast. I was sucking down throat lozenges just listening to the guy. I was watching the Canucks game Sunday at my brother-in-laws place in North Glenmore when the cable went out following the conclusion of the 1st period. I questioned if he had paid his cable bill? I figured he had after a next door neighbor came out of her home asking if we were experiencing the same problem. Shaw likely got several nasty phone calls from hockey fans in that area of Kelowna that were unable to watch the entire 2nd period. I left happy though as the Ducks held on for a one goal win. I have noticed one significant difference between Kelowna and Swift Current when it comes to dealing with local businesses. In Kelowna nothing...and I mean nothing is for free. I met my mom and sister for what was designed as a nice noon lunch in downtown Kelowna. I was pleased to see that the restaurant we selected served breakfast all day. I ordered a Mexican dish which features eggs over easy. I am not a fan of my eggs running all over my plate so asked if I could get them scrambled instead. The waitress went to the kitchen to make my request only to return to the table to tell me it would be a 50 cent charge to have them scrambled! How tough is it for the chef to scramble my eggs instead of having them cooked over easy? Will he get his favorite cooking utensil dirty? What's next, an extra charge for ice cubes in my water? Congrats to the Giants and Tigers for winning their respective conference's, and what a matchup it will be in the Western Hockey League final. These two teams met just twice this season - both in the Hat - with the Giants beating the Tigers 5-4 in overtime in early November before the Tigers recorded a 3-2 win January 12th. Once again both games were played at the Arena in Medicine Hat. The last time the Tigers were in Vancouver was January 16, 2006 in a 3-2 win. Matt Keetley was in goal for the Tigers on that night while Dustin Slade took the loss for Vancouver. Remember no matter what happens in this series the Tigers are assured of a birth at the Memorial Cup. In saying that the Tigers want another WHL Championship banner to go with the one they captured three years ago with a four game sweep over the Everett Silvertips. This time it won't be so easy. The only reason I say that is because of home ice advantage. What's happened to Giants overage d-man Cody Franson? You would have to think he's playing injured considering his lack of point production in the WHL playoffs? Just 5 points in 15 playoff games is surprising considering he had 51 points in 59 games during the regular season and was named the Western Conference Defenseman of the Year because of it. Some suggest Franson shouldn't have been named the West nominee for d-man of the year - Blazers 20-year-old Ray Macius should have been! Franson had just 15 points after Christmas while Macius had a whopping 30! Of those 30 points - 17 were goals. Makes you think the media got it wrong in voting Franson the conference's best blueliner? Macius wasn't just great after the break, he was consistent all season long putting up 70 points in 70 games. Franson is against the Tigers Kris Russell at the WHL awards banquet this week in Calgary with Russell the shoe-in to pick up the award. Okanagan hockey fans should be somewhat interested in the 'dub' final. Westbank resident Scott Wasden plays for the Tigers. Wasden has 7 points in 16 playoff games. Giants d-man Cody Franson is from nearby Sicamous. The Tigers get home ice advantage in the WHL final because they had 7 more points than the Giants during the regular season. The Tigers had 7 more wins than the Giants yet the same number of regulation losses - 17. The Tigers scored 9 more goals than Vancouver during the regular season while the Giants allowed 32 fewer goals. To make matters even more interesting the Tigers had the best power play during the regular season while the Giants had the best penalty kill. When was the last WHL final where the host of the Memorial Cup that season also advanced to the championship series? The Kamloops Blazers hosted the Memorial Cup in 1995, and advanced to the league final against Brandon. The Blazers would win that series in 6 games before the two teams again met at the Memorial Cup. The Blazers would win Major Juniors top prize. 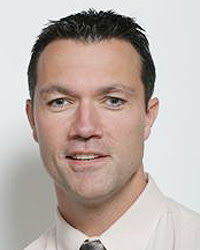 Rockets assistant coach Ryan Huska was a member of the Blazers that season, winning a Memorial Cup title for a third time. Who was the Blazers head coach that season? Current Giants bench boss Don Hay. The Brandon Wheat Kings have a new arena..sort of! The facility remains the same, but the name has changed. The Keystone Centre is now known as Westman Communications Group Place!! I don't like the name either. The name change is effective May 1st. The 'Cable Box' is expected to get some upgrades like a high definition monitor enhancements on the concourse and an electronic reader board messaging system. My thinking is forget the technology. The first order of business should be getting rid of the smell of cow crap from the building. And I think it's well documented that I am not a fan of the Canucks. I got a kick out of this picture making the rounds on the internet. The Cougars coaching staff couldn't avoid the numbers, and threw overage goaltender Scott Bowles between the pipes in game four and it paid off. Bowles led the Cougars to an overtime win avoiding playoffs elimination before another solid sellout crowd last night at the CN Centre. Bowles has had more success over his career against the Giants than Real Cyr so statistically making in the change in goal made sense. It's a no-brainer who will start in game 5 back in Vancouver! Obviously the only way for the Cougars to win this series is to force it to a seventh game. When was the last time a Western final went 7 games? It was the 2004 playoffs where the Everett Silvertips beat the Kelowna Rockets in 7 games. Did I mention that the Rockets had a 3-1 series lead - much like the Giants do - only to see the Tips roar back with 3 straight wins to capture the series? Being down 3 games to 1 is grim, but it's not impossible. Drew Schoneck deserves a different title next season. It should read 'Head Coach of the Prince George Cougars'. Whatever happens in the Western Conference final, Schoneck should have 'associate' taken off his title next season. Schoneck was brought into a pretty tough situation after Mike Vandekamp was relieved of his duties just prior to the start of the campaign and managed pretty well under the associate coach role. He kept his head above water despite what I'd call uncomfortable circumstances that saw GM Dallas Thompson breathing down his neck on the bench through a good portion of the season. I doubt if Schoneck would admit it but having Thompson there must have made him feel he was incompetent. It often looked like management thought he needed to be babysat to guide the Cougars in the proper direction. I think Schoneck deserves a chance to carry the torch next season. Sure their may be more high profile candidates out there with a bigger resume, but the Cougars players appear to play for the likable coach. Getting the Cougars to the West final is no small feat, and Schoneck deserves a pat on the back with a one year contract extension in his back pocket. Peter Anholt's time is up in Prince Albert. The Raiders head coach won't have his contract renewed when it expires at the end of May. The Raiders just squeezed into the playoffs this season and missed it entirely a year ago. The reason why Anholt's departure interests hockey fans in the Okanagan is because Anholt coached the Kelowna Rockets for two seasons (96-97 and 97-98) before landing on his feet as an assistant coach in Red Deer the following season. You would think several WHL assistant coaches will be chomping at the bit to have a chat with Raiders GM Donn Clark on the vacant job. What other WHL coach finds himself in a similar situation as Anholt? Is Mike Williamson safe in Portland? Maybe blog buddy Andy Kemper can pipe in on that hot topic. I spoke to Jeff Truitt on his time at the World Under 18 Championships in Finland. The Kelowna Rockets head coach says it was a joy working with Trent Yawney. Yawney has NHL experience most recently as the head skipper of the Chicago Black Hawks but appeared to have an open ear for suggestions from Truitt and his coaching staff. The worst thing a coach can do is take total command and have his assistant's do nothing more than push pucks in practice. Truitt's international resume is becoming a long one yet he isn't about to consider joining Team Canada anytime soon for another trip overseas. Being a member of the coaching staff at the Under 18's this fall and the World Juniors at Christmas time is a possibility but for the moment Truitt wants to enjoy the off season and some time with his wife and two young children. Kelowna Rockets listed player Brock Trotter had a great season with the University of Denver. Trotter, who turned 20 in January led the U of D in scoring this season with 40 points after spending last year on the shelf with a severed right Achilles tendon. He was cut in the back of the leg after hitting a North Dakota defenseman in a race for a lose puck in the corner. The Brandon, Manitoba resident is a small forward standing 5'10 and weighing 170 pounds. Alex Edler saw limited playing time in the Canucks 5-1 loss in Anaheim last night. The former Rockets d-man had 8:44 of ice time. What's amazing is 'Eddie' could have played with the Rockets as a 20 year-old this season. Ducks forward Travis Moen (a former Rocket) had over 15 minutes of ice time in the win. You have to hand it to the Vancouver Giants for keeping the Prince George Cougars top players at bay in the Western Conference semi final. Devin Setoguchi and Nick Drazenovic were deadly in the Everett series, but have been basically nullified in the West final. Setoguchi had 5 goals and 6 assists for 11 points against the Tips and was a +5. Against the Giants in the first three games he has just 2 assists and is a minus 4. Drazenovic had 7 goals and 4 assists against the Tips in round two and has just 2 assists and is a -1 in this series. The old adage of your best players have to be your best players is likely ringing in the ears of every Cougars fan heading into game 4 tonight at the CN Centre. Trailing 3 games to none, who do you start in goal in game 4? As the Shania Twain song goes - Dance with the One that Brought You - the Cougars should go with Real Cyr in a crucial game four. It was Cyr that played a huge part in helping the Coug's get past Kamloops and Everett in rounds one and two, and it will be Cyr not Bowles who will be back with the team next season. Do I like the Cougars chances of getting back in the series? But I know one thing. The Cougars won't go down without a fight. NHL Central Scouting released it's final list of North American born players for the upcoming draft. For the first time ever a Tier II player is rated #1. 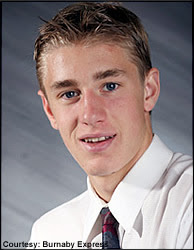 Kyle Turris, who played in the B.C Hockey League with Burnaby this season is rated as the top North American prospect. Turris scored 66 goals this year. Turris was rated #5 at the mid term rankings. It's the first time a player from Tier II has been ranked #1 in Central Scouting's 31 year history. Angelo Esposito was rated #1 at the mid term rankings but has fallen to 8th. Turris has committed to play at the University of Wisconsin next season. The top WHL player for June's draft in Columbus in Kamloops d-man Keaton Ellerby, who moves from 6th to 4th. Calgary Hitmen's Karl Alzner is rated 8th while Zach Hamill of Everett is 9th. The top W.H.L goaltender is Regina's Linden Rowat who had a strong playoff and moved from 6th to 4th among North American goaltenders. Ok Cougars fans you can use one of many sports cliches considering your team is down 3 games to none. Take your pick. 1) It's do or die. 2) They're behind the eight ball. 3) They're in a must-win situation. 4) They need a win to stave off elimination. 6) If you lose, you go home. 7) They’re down but not out. 8) They've got their backs against the wall. The Humboldt Broncos beat the Selkirk Steelers 6-3 Tuesday night and now have a 2-1 lead in the Anavet Cup final. Former Rockets forward Brent Howarth had an assist in the game for the Steelers in a losing cause. Oddly enough games four and five are in Humboldt before the series shifts back to Selkirk for potentially a game 6 and 7. Bottom line - the Steelers need to win one game in Saskatchewan or Brent Howarth's dream of playing at the Royal Bank Cup will be over. Travis Moen and the Anahiem Mighty Ducks face the Vancouver Canucks tonight in the second round of the NHL playoffs. The former Rocket will be playing in his 15th career playoff game tonight. Moen averaged about 16 minutes of ice time in a first round series with Minnesota. Moen just celebrated a birthday on April 6th, and is the son-in-law to Rockets Director of Player Personnel Lorne Frey. It should be pretty obvious who Frey is cheering for in this series. I wouldn't be surprised if Lorne is down in California for a game or two. He'll likely be there unless Rockets GM Bruce Hamilton has tight reins on him wanting Frey to scout until the very last minute considering the WHL bantam draft is just a stone throw away. If you missed it the Canucks have recalled former Kelowna Rockets defenceman Alexander Edler from the Manitoba Moose of the AHL. Edler, 21, has played in 22 regular season games with the Canucks this season, recording three points (1-2-3) and six penalty minutes. The 6-3, 220-pound. native of Ostersund, Sweden was selected by Vancouver 91st overall in the 2004 NHL Entry Draft. I spoke to Troy Ofukany today. The former Rocket now Regina Pat is taking it easy in his hometown of Kamloops. He is looking at undergoing surgery on his right thumb this summer. Ofukany pulled some tendons in the thumb back in January and was wearing a playing cast for about a month. In the playoffs he took it off to give him more mobility. Ofukany feels the Pats will have an extremely strong team next season, and envisions himself playing a huge role in the club's success. I asked him what the biggest difference was between Kelowna and Regina? He said the older players are treated as men, not boys and when they win they are treated extremely well. When they lose, Head Coach Curtis Hunt cracks the whip. Ofukany is crossing his fingers that he gets a pro tryout this fall. The now 20 year-old has never attended a pro camp. My writing critic in Prince George (Jim Swanson) tells me that the Kamloops Blazers have given the green light to beer sales next season. The Blazers had a three month trial period where beer was allowed in the stands at home games and the consensus is it works! Next season Blazers fans will have three things to complain about at home games. The teams play, the bad officiating and now cold beer. I did watch last night's Canucks game and thought from the opening face-off it would be a long night. No it wasn't that the two teams were so evenly matched, but CBC's scoreboard ticker at the top of the screen showed that the game was in the first overtime. CBC producers noticed this error about 3 minutes into the game, and quickly took the ticker off the screen only to replace it moments later with the correct 1st period showing. You have to love Jim Hughson. The TV play-by-play man does an excellent job and provides incredible insight beyond just calling the game. While Harry Neale may have gotten a bad rap for his lack of substantial comments in the opening round series between the Stars and Canucks, it must be tough for Neale considering Hughson seamlessly throws in odd tidbits about a player as the game is going on. When a whistle blows and Harry has a chance to talk he has little to say because Hughson has left very few stones unturned. I had heard that Hughson wanted to work with Neale in the opening round as opposed to Drew Remenda. Hughson does have some pull other than just calling the games. I remember four radio play-by-play broadcasters growing up in Southwest Saskatchewan. But before I get into that let me state that the internet was a none factor growing up in Swift Current, Saskatchewan back then. Listening to the radio was. Ok I'm old, I'll admit it! When I was growing up we rode bikes for entertainment or threw the football or baseball around. We didn’t sit around infront of a computer monitor surfing for hours with a bag of chips by our sides. As a kid, radio was king. That’s where the real sports fan would go to find updated information. Their was no internet, and Sportsnet and TSN were a pipe dream back then. I mean who would watch a 24 hour sports channel any way? If you had two TV channels to pick from you were living the good life. Locally I'd listen to the radio and hear John Enns calling Swift Current Broncos games and then later a gentleman by the name of Carl Pedarosha who was the voice of the Swift Currrent Indians during the teams time in the Saskatchewan Junior Hockey League. I'd often be able to tune into the voice of the Saskatoon Blades - a young Roger Millions. The only other play-by-play man I can recall listening to was Peter Loubardias. Loubardias was the voice of the Regina Pats at the time, and in my world was the first broadcaster I had heard on radio that was animated on the air. Enns and Pedarosha called the game with accuracy but Loubardias was different. Despite a high pitched voice - which I swear hasn't changed since he was 13 - he caught my attention. As a young 18 year-old working at the local radio station doing the meaningless task of playing religious tapes in the evenings, then Sports Director Kevin Smook (like that was his real name!) came up to me one winter day and asked if I wanted to do color for Loubardias. I was scared, nervous and excited all at the same time. I thought to myself.....this is my big break. I can share the airwaves with Loubardias - wow !! I remember meeting Pete up in the broadcast booth for the first time, but being a dummy I arrived while he was on the air during his pre-game show. During a commercial break he introduced himself and told me to throw on my headset and we'd chat 'on the air' after the commercial break was over. I don't think Loubardias knew what he was getting himself into when he had me by his side that night as the Pats and Broncos faced off at the Civic Centre. Pete has little 'bass' in his voice but must have sounded like James Earl Jones when we he introduced me as his color guy for the evening to the Pats fans back in Regina. Let me just say that puberty came late for me, and I could have been an ideal candidate for an all boys choir - even at 18. I would have hit the high notes to perfection. I recall Loubardias calling a great game that night, yet his color guy (me) was less than stellar. But even though Loubardias probably thought in the back of his mind that I stunk, which I did, he never let on during or after the broadcast was through. Years later at the Memorial Cup in Quebec City in 2003 I saw him and hoped he wouldn't remember me. He did, and we talked about that day when I joined him in the broadcast booth on my first official hockey radio broadcast. Pete is as gracious today as he was back then. If you ever have a chance to say hi to Loubardias - do. He loves junior hockey, and loves people. On that faithful day when I was 18 he showed passion for a want-to-be broadcaster who was green behind the ears. But before you get carried away and think I have a Peter Loubardias shrine at home which includes a picture of him on my wall, I don't. My wife wouldn't allow it! Seriously though my experience with Pete is one of the real reasons why I chose what I am now doing for a living. I am hoping I can return the favor to someone who was as keen as I was in getting into the broadcast industry and calling hockey games on the radio. Pete Loubardias was a class act back then, and remains the same to this very day. I'm hoping I can follow his lead. Cougar Fans Donning Rally Caps/Truitt World Juniors? Put on your rally caps Cougar fans because getting back in this Western Conference final with Vancouver won't be easy. Despite being down 2 games to none the good news is games three and four are back in your barn with a sellout crowd on both nights at the CN Centre. I may be stating the obvious here but a loss tomorrow night by the Cougars and it's over. It's imperative they win tonight if they have any chance of prolonging this series. Down 0-3 and it's lights out! While Real Cyr was yanked in game two in favor of Scott Bowles, it would be a huge mistake to go with the overage in game three. Cyr has been the savior in the playoffs, and a stumble in game three doesn't mean a permanent place on the bench. Every goaltender is awarded a mulligan, even in the playoffs, and Cyr has just used his up. I anticipate if the coaches show faith in starting him in game 3, he will rewarded them with a solid performance. I am by no means a Calgary Flames fan but the sight of all of those red jersey's in the stands at the Saddledome in game 6 of their playoff series last night with the Red Wings is awfully impressive. Sure I've seen it before but for whatever reason they really caught my attention last night. They seemed to offset the red faces the Flames had on the ice as they desperately held on by a thread in an attempt of sending the series back to Detroit. As I've stated, the Saddledome is not on my list as one of my favorite rinks to call a W.H.L game but sitting in the stands as a fan in a different story. I have seen the Flames three times on home ice, twice with the Rockets and once with the Broncos as the WHL teams treated the players to some NHL action. The one time I was with the Broncos we had a chance to catch Mario Lemiuex at the height of his career. Lemiuex was a disappointment on the night I saw him. I will always remember his lack of urgency defensively, and back checking appeared to be painstaking for Mario. I honestly found him lazy. Maybe it was just an off night? Mario was anything but magnificent when I saw him up close. Thank goodness one game does not make a career. Three members of the Kelowna Rockets return from Finland with a bit of an empty feeling after losing in the bronze medal game at the Under 18's on Sunday. Luke Schenn wore a Canadian jersey while Jeff Truitt was an assistant to Trent Yawney. Rockets Athletic Therapist Jeff Thornburn was also on the team Canada medical staff. Despite failing to earn a medal, Truitt likely took another step on becoming a potential candidate for a coaching position on the Canadian World Junior team at Christmas while Schenn only saw his stock grow in the eyes of the national team scout staff. Schenn wouldn't get an invite to this years World Juniors, but he has to be on the radar in 2009. Is WHL hockey really that much better than Junior 'A'? Brent Howarth was again instrumental in helping the Selkirk Steelers tie their Anavet Cup series at one win apiece after a 2-1 win over the Humboldt Broncos Saturday night. Howarth, a former Rocket was named the games 1st star. Brent Howarth has been nothing short of excellent for the Steelers all season and in the playoffs, making you wonder why he didn't have the type of offensive success with the Rockets. Was it change in attitude? Is it receiving a greater opportunity as the Steelers go-to-guy after playing a checking role and ultimately second fiddle in a Rockets uniform for the majority of his W.H.L career? I can't for the life of me think he would have put up even half the totals he did this season in the Manitoba Junior Hockey League if he had stayed with the Rockets as an overage. Howarth is 3 wins shy of advancing to the Royal Bank Cup which will be played in Prince George. No matter what level of hockey he's playing, Howie is close to earning a championship. I will admit I didn't like him much when he first came on the scene, but CBC analyst Kelly Hrudey has grown on me. From time to time I have heard him on a Vancouver sports radio station and Hrudey tends to ride the fence on issues but his insight from a players perspective is very good and he gives you a good sense of what a player is thinking, especially in an overtime game like last night between the Flames and Wings. Color Analyst Drew Remenda may not be a favorite of mine for TV, but I have gotten to know him over the last couple of years because of his radio talk show in Saskatchewan. Drew does work for CBC on Hockey Night but he also has the Drew Remenda show on a Saskatoon radio station 5 days a week. Remenda is a class act and is always willing to chat with even us little people in the W.H.L. NHL.com had an article featuring new players expected to make an impact with their respective club next season. King played 27 games with the Blues this season. 'Kinger' got into 8 scraps. If the Canucks fail to win tonight I will be one of likely just a few hockey fans in this province who won't shed a tear. With the Canucks and Dallas tied at 3, fans are already asking if the team should have done more at the trade deadline. Should they have acquired more scoring rather than simply depending on the Sedins and Markus Naslund? Sure Roberto was an upgrade in goal, but the last time I checked if you can't score you won't win to many hockey games. When will Canuck fans get it through their heads that Brendan Morrison just doesn't have it? He's looked upon to be an impact guy but he often times does little to impress. Sure he's ok during the regular season but he is anything but special in the playoffs. Will I watch tonight's game? Will I grimace in pain when they lose? What former Vancouver Giant was eliminated in Sunday's NHL playoffs? I'll give you a hint...he's a former Kelowna Rocket. You have to hand it to Tarnasky for sticking with the Lighting this season. Tarnasky was anything but a special player when he wore a Rockets jersey in 2002-2003, playing in just 39 games before being shipped to Lethbridge. No one at the time, including myself would have ever guessed that he'd play a game in the NHL let alone 77 with the Lighting this season. Not bad for a 9th round pick of Tampa in 2003. 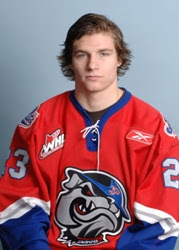 Tarnasky broke into the WHL with the Vancouver Giants in 2001-2002 where he played just 10 games before he was sent to Kelowna. I've Got Bragging Right's So Far! Matt Keetley was perfect on Friday night. Sadly, the same couldn’t be said for this paper’s playoff prediction crew, though Regan Bartel came pretty close. The WHL’s Conference championships began on two fronts on Friday evening, with Medicine Hat playing host to Calgary and Vancouver entertaining Prince George. Both home teams won to take 1-0 leads in their best-of-seven series, including Keetley turning aside 24 shots in the Tigers’ 2-0 victory. That Medicine Hat won isn’t surprising; the Tigers are one of the WHL’s elite teams this season. What is surprising is Calgary and Prince George having advanced to the third round, courtesy of second-round upsets that most didn’t predict. Unless you’re Bartel. Play-by-play caller for the Kelowna Rockets, Bartel predicted Calgary would upset Brandon, one of three picks he got right of the four second-round series. Only Prince George’s upset of Everett prevented Bartel from a clean sweep. As for the remainders, well, we didn’t fare as well. Rockets head coach Jeff Truitt was 1-for-4; assistant coach Ryan Huska, 1-4; assistant coach Kim Dillabaugh, 2-4 (including Calgary over Brandon); and yours truly, 1-4. Overall, including first-round results, Bartel is the leader at 8-12, with Huska and Dillabaugh at 7-12, while Truitt and myself are 6-12. Notably, Truitt wasn’t available to make his third-round picks. Currently, he’s in Finland as an assistant coach with Team Canada at the world under-18 championship. Today, Canada, including Rockets defenceman Luke Schenn, will play Sweden for the bronze medal at 4 a.m. (TSN), while U.S.A. will play Russia for gold at 8 a.m.
Again, and, like last time, we hope you find our predictions to be a tasty read. Huska: Medicine Hat in five. The team is playing so well right now and they’re feeling good about themselves. That, and they’re such a good, quick team. Dillabaugh: Medicine Hat in six. The Tigers have better depth and they’re really playing well right now. Bartel: The Hitmen have bit off more than they can chew in this series. The Tigers’ small, yet speedy, forwards will give the Hitmen fits in the attacking zone, and East MVP Kris Russell will be a calming influence as the intensity of this Central Division rivalry heats up. Tigers in five. Potenteau: Tigers in four. Why? Not enough rest between series for Calgary; the Tigers finished finished 22 points above the Hitmen during the regular standings; Medicine Hat defenceman Kris Russell is having an MVP season; the Tigers suffered just seven losses on home ice during the regular season (five regulation time, two in overtime) . . . . need I go on why the Hitmen won’t win this series? Huska: Vancouver in six. Prince George’s fans are excited again, so I think Prince George will play well at home. Dillabaugh: Vancouver in five. Prince George’s defence won’t be able to handle Vancouver’s forwards, especially the Giants’ physical forwards. They’ll wear down Prince George’s back end, which will result in turnovers and mistakes. And Vancouver has the forwards who can capitalize. Bartel: The Cougars will pay for not earning home-ice advantage in this series, as the Giants play so well at home — a place where the Cougars couldn’t win in four games this season. Much like the Hitmen in the East final, who were the third seed coming into the playoffs, the Cougars’ Cinderella season will end in five games. Potenteau: After maligning Vancouver with my last pick, by choosing Seattle in an upset in seven, I’m selecting the Giants this time around. In six, though my gut says sweep. As good as Prince George has been playing of late, with their six-game victory over Everett as proof, the Cougars don’t have the offensive or defensive depth the Giants do. Over time, this will be the deciding factor. Quick Thoughts on a Saturday Morning! No real surprise on the opening night of the WHL Conference finals. I expected the Giants to grab game one. Even though it was a 1 goal win, I get the sense that the game wasn't at close as the score may have indicated. The Giants play such a strong systems game and rarely deviate off the plan. It's that structure that allowed for very few Cougars chances offensively last night, and had goaltender Real Cyr been sleeping at the wheel the score could have been worse. When you play a team which plays such a structured game you need to score the opening goal to force them to open up. If the Giants score first, like they did last night, it will be extremely tough for the Cougars to battle back. The good news is the Cougars have been in this situation before having lost to Everett in the first two games before winning games 3 - 4 - 5 and 6. I am not saying they will lose game two tonight but they know how to play for behind. Anything is possible, but the Cougars have to play error free hockey in this series, something they didn't necessarily have to do in rounds one against Kamloops and round two against the Tips. I chuckled a bit at the comments from Tips GM Doug Soetaert about his team being the better team despite losing in 6 games to the Cougars in round two. Individually maybe, but the last time I checked it takes an entire 'team effort' to win a game - a series and a championship. Individualistic hockey, or individuals simply not showing up won't do it for you. "Success in the playoffs is 1 percent inspiration and 99% perspiration." Often times it's not the team that has the most individual talent, but the greatest work ethic and desire that wins. Tips forward Peter Mueller was asked in the same article if he wants to return next season? Let see...get paid big money and play in sunny Phoenix or go back to junior and ride the bus across Western Canada? Mueller made the right comment by saying he would like to return to Everett if things don't work out with the Coyotes, but his heart and mind are fully directed towards wearing a Coyotes jersey next season. I had a chance to watch a bit of the Shaw coverage of the Hitmen/Hat series last night. What amazes me is that after Dan Russell has concluded his play-by-play duties on Shaw, he goes directly to his Sportstalk radio show heard across the province of BC. With the game ending in the Hat last night just before 9, Russell quickly grabs a breath before putting on his radio headset and beginning his radio show. The time between the game ended and his radio show starting is like.....5 minutes max. The amazing thing is Russell doesn't even show fatigue after calling a hockey game for 2 plus hours. He's sounds fresh and prepared as he takes the radio airwaves, and the average listen would have no clue he had just spent the last 3 hours doing a junior hockey game. I guess it shows how much of a pro he really is. The other day I wrote about my broadcast colleagues that are fortunate enough to be calling games in the Western and Eastern Conference finals starting this weekend in Vancouver and Medicine Hat. 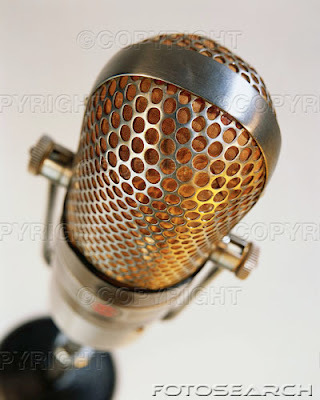 I thought I'd give you my impression on all of the radio broadcasts across the Western Hockey League. Let's start in alphabetical order shall we? Quirky would best describe him. I can say that because we've gotten to know each other over the years. Mike does play-by-play with his shoes off which should prove that I know him pretty well. He has an unorthodox eating regime during a game up in the broadcast booth which concerns me though! He has everything in order from left to right - chips - licorice - mini oreo cookies - more chips and some hard candy. Funny thing is he isn't even fat! If you want to meet someone who is high on life, Mike Boyle is your man. Two words - great guy !! If I'm not mistaken Tom is the original radio voice of the Rockets. The Tacoma Rockets that is. Beuning has a soccer background and calls indoor soccer besides doing his WHL duties with the T-Birds. I honestly have never heard him other than the interview he does on the video screen at the Key Arena with the head coach prior to the start of the game. Tom comes across reserved and somewhat shy but when the mic is on - it's show time. 'Curly' is an individual you just can't hate. He could slap you in the face and you would still like him. It may have to do with the fact he is from Saskatchewan? The former voice of the Lethbridge Hurricanes, Curle always has a smile on his face and simply enjoys his job. It really shows! While he is great at what he does he doesn't take his job to seriously. He calls a spade-a-spade and has an objective eye for the game. You can tell that he's honest and upfront with you whether he is talking about his team or yours. I have heard him call a game only a few times but in my opinion he is interchangeable with Rod Pederson as the top 1-2 radio broadcasters in the East. I really look up to Fraser. No I really do. He's 6'4 and I'm just 5'9. He towers over me. Cap'n Kirk must have a Blazer logo tattooed somewhere on his body? He waves the team flag and has little to nothing bad to say about the Blazers - ever. I've probably heard Kirk the most of anyone out West, and he does a bang up job. He has no color guy at home but really handles the duties well. I'm a voice guy, and think he's got one of the best set of pipes in the league! I am not sure if he has a horseshoe up his pigu (it's the Mandarin Chinese word meaning ...) but since he came into the WHL as the voice of the Tips he's always called a winner. Oh I know the Tips haven't won a league championship, but has he ever called a really bad team? Even in the expansion year in 2003-2004 the Tips were good. Gerhart is a great host and is willing to come out with you after a game if we are fortunate enough to be staying overnight in Everett. He loves his Tips and wears his heart on his sleeve. My general impression is he wants to win more than the players do. I honestly don't know James Gallo that well because he's relatively new on the scene. You can tell that he has a passion for what he does and wants to get better. That's what I like about him. He has the love for the game and genuinely wants to see the Warriors succeed. Call him a homer - but we all are! Jeff and I have gotten to know each other over the years because the Ice and Rockets have met so many times in the playoffs. Man have we been apart of some battles....on the ice that is. Plus some controversy up in the broadcast booth including Governor Ed Chynoweth getting into a yelling match with Rockets GM Bruce Hamilton and Kootenay GM Jeff Chynoweth throwing a chair in the media area creating a creator in the wall at Prospera Place. The wall needed a new paint job anyway. Hollick is intense, and for my money has one of the best grasps of what is happening around the WHL. No not just with his team but with others. Kenward and I essentially changed jobs when l came to Kelowna in 2000. He moved to Swift Current to do the play-by-play after doing color in K-Town with Rick Ball. Kenward is a keener, and is always in the loop on what's happening. His understanding of the game is tremendous, and despite being one of the 'younger' radio guys in the league he has done well for himself a big center after starting his career in the smallest market. Plus he has the privilege of calling the games at the 2007 Memorial Cup. He'd also get the nod for best dressed broadcasters. Who's the worst dressed radio broadcaster? I won't even go there. It doesn't matter anyway - it's radio!! I have listened to Keen several times and his game calling gets better every year. While he feels he's been doing games for a long time, he really hasn't yet sounds like he has. If I compare him with where I was after 5 seasons he beats me by a country mile. Plus he probably does some of the best features in the pre-game show and intermissions of anyone in the WHL. His two part series on the Broncos bus crash in December was dynamite. He's a good guy because he's from Saskatchewan! The voice of the expansion Chilliwack Bruins. I have had only small talk with him on two occasions but his color analyst Dave Sheldon and I have gotten to know each other well because of two playoff battles between the Tips and Rockets, including a West final in 2004 and a West semi in 2006. Sheldon jumped ship and landed in Chilliwack after being the colorman with Keith Gerhart on Everett Silvertips broadcasts. Les gets props for calling some bad teams over his time in 'toon town'. I can't imagine what it was like calling Blades games when they won just 7 times a couple of years back. 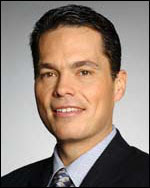 Lazurak is one of the senior broadcasters in the WHL. Is it bad to call Les a senior? Lazurak is always friendly, prepared and loves the junior game. Les believes every year the Blades have a chance to win it all. It's that type of optimism that has the Blades knowing he will never throw down his pom-poms no matter how dismal the season is. How long has this guy been around? As long as me....ouch that's a long time. Luebke knows the league inside out and does a nice job of stepping up for us broadcasters if we have issues with the league. What's most impressive about 'Luber' is he is immune to the smell of cow crap at the Keystone Centre. David Blaine move over. Not even you could accomplish that feat. Sure you can hold your breath under water for 5 minutes but you wouldn't last 30 seconds with the stench at the Keystone. Martens would be in a dogfight with James Gallo for 'who's greenest behind the ears' when it comes to WHL broadcasters. He's another one of my colleagues I don't know very well. He took over from Brad Curle who moved on to Calgary which would have been extremely tough trying to fill his shoes. 'Mooner' has something on all of us radio broadcasters. He's actually played in the league. The rest of us are wanna-bee's. 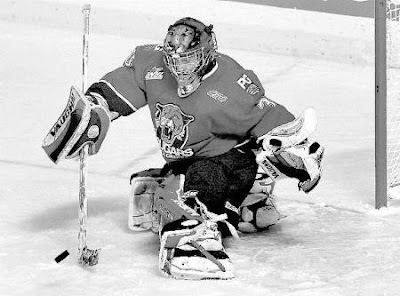 Moon didn't have a stellar career in the dub as a goaltender with the Medicine Hat Tigers/Saskatoon Blades, but he actually wore a WHL jersey. I've only touched one. Moon is a great guy who makes you feel at home even when you are on the road. He's a class act and a guy you can't help but like. I always hear bad things about 'Roddy' but I don't have a problem with him. Maybe that will change if the Rockets meet the Pats in the league final someday? He's a good showman on the air, and is extremely personable off it. I know he likes to stir the pot but that makes Roddy - Roddy. I would far take him over someone who is politically correct and is scared to criticize a player from his team or the opposition. Pederson doesn't ride the fence, he jumps right over it! Pederson has an opinion and will share it and that's what makes for an interesting person. You may not like what comes out of his mouth at times but he sure isn't like vanilla ice cream - bland. Ok I just offended anyone who likes vanilla ice cream!! How he juggles doing the Pats and Riders football is beyond me, but like I stated earlier he's in a battle for 1-2 as the best callers of the game out East. I wish I had the energy of this young fella. Rid's is such a good guy (have I used that phrase a few times here? ), and has been doing junior game since the 70's. I've listened to him before, and he still has the energy of a 18 year-old who just got jacked up on Starbucks. When he officially calls it a career he's going to have to write a book on the players and coaches he's been to war with as the voice of the Tigers over the years. I wish he had a blog. It would make for some good reading. Come on Rid's. You not only drive the bus and do the games but can't you find some time to do a daily blog? All joking aside Rid's is a class act that we as radio guru's respect. He has something in common with Nashville Predators radio man Eli Gold. Both are solid race announcers who have moved over to the game of hockey play-by-play. I heard St. Clair at the Vernon Motor Speedway last summer and he is tremendous. His knowledge of the sport of auto racing (is that what it's called Ron?) is mind boggling, and if his hockey play-by-play is even close what a treat he must be for the folks in PG. They call him 'Scooter' yet I am not sure why? Someone in Portland give me the goods? I'll admit I haven't been able to get to know him very well over the years mainly because he is usually doing 500 other things before game time. Then I am going to the washroom in the intermissions in Portland he is on the ice either MCing a contest or calling play-by-play for some tots game. Considering he has been in the league forever (ok not forever but a long time), I tip my hat to him for traveling on the bus with the Hawks all these years. While the Hawks don't have as bad a road schedule as Prince George or Brandon it has to be close to one of the toughest. Westy's knowledge of the league and past players that have donned a WHL jersey is amazing. Never one for few words, West is a former goaltender and if I am not mistaken also did some officiating in his younger days. The Vin Scully of the Western Hockey League, he always has time to chat whether he's at home or on the road. Not one to smile often, he always has an opinion which makes him interesting to chat with. Drew and I first met at a radio 'team building session' a couple of years back when he was doing play-by-play in Trail BC. We got into a fight! No we didn't..........it's a joke for crying out loud! 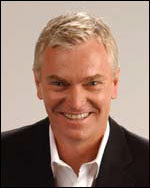 A soft spoken gentleman with a good heart, Wilson may have made the move to the Western Hockey League in the latter stages of his radio career but like any new radio junkie who just graduated from broadcast school, the love and passion he has for radio and calling hockey games still exists. He may not show it outwardly but he is probably doing cartwheels inside! These are the radio announcers (excluding me) that make up the Western Hockey League. All 20 bring different qualities to the airwaves and commit an amazing amount of time during the winter broadcasting junior hockey games. They spend countless hours away from family and friends and spent days, evenings and night's on a bus traveling across Western Canada. But don't feel sorry for these guys because they probably wouldn't have it any other way. They all have one commonality; they love radio, they love hockey and conversely they love the team they broadcast for. Ask any of them and they will all say it's the best job they could ever have! Could Troy Mick be on the move? You would think the General Manager of the Vernon Vipers would be gathering interest at a higher level after helping build the Vipers into a league contender for the BC Hockey League title? The Vipers advanced all the way to the finals before being ousted by Nanaimo in game 6. I spoke to Mick yesterday about potentially moving up in the hockey world, yet he remained politically correct by telling me he is keeping all of his options open with rumors that include him leaving the game all together. Mick is known to Western Hockey League fans as a player and then coach in the Tri Cities and most recently with the Kamloops Blazers. Mick did tell me he would not consider coaching again, and if he remains in hockey it would be at the player development/administrative level. What also was interesting was Mick told me he has no contract with the Vipers. He has a trust in his relationship with the organization, and a contract isn't needed in his eyes. I also spoke to him about Rockets prospect Kyle St. Denis. He said St. Denis was very good in the first two rounds before struggling as the checking got tighter in rounds 3 and the league final. But as Mick pointed out, he is just 16 and predicts he will be a top 5 scorer in the Western Hockey League in two years time. Bold statement for a GM who should be applauded for his efforts with the Vernon Vipers this season. I thought it was interesting to hear that Shaw will be doing the Eastern Conference Championship final rather than the Vancouver-PG tilt. It would have been nice for hockey fans in BC to be able to watch what is expected to be a great series, and considering the distance between the two centers, it would have been ideal. The way I see it, if fans from Calgary really want to see the games in the Hat - drive! Let's just say it would be a little harder for Cougars fans to make the trek to Vancouver and vice versa. Yet with the Canucks potentially moving to the next round of the playoffs that may have played a factor in Shaw's decision. By the time the East final starts the Flames should be eliminated! Shaw has committed to doing games 6 and 7 of the Western Final, that's if those games are necessary. But don't fret Cougar fans. Game 2 of the West final will be televised on Rogers Sportsnet - on tape delay with Peter Loubardias calling the action. One day I will share my experiences with Pete and Darren Dreger when I did the color commentary for them when Loubardias was with the Pats and Dreger was the voice of the Brandon Wheat Kings. I e-mailed Joe Kenward - the Giants radio guru - the other day and told him I was jealous. This is the greatest time of the year to be calling hockey. The intensity increases and so much is on the line every night. For Kenward, Ron St. Clair (PG), Brad Curle (Hitmen) and Bob Ridley (Tigers) we fellow broadcasts on the outside looking in would love to be sitting where you guys are come Friday night. Dan Russell and Bill Wilms also have the luxury of watching some of the best hockey this league has to offer in their coverage of Shaw broadcasts. You are all lucky men - enjoy! Brent Howarth's hopes remain alive for a birth at the Royal Bank Cup in Prince George. The former Rocket and now Selkirk Steeler begins game one of the Anavet Cup against the Saskatchewan Junior Hockey League champion Humboldt Broncos Friday night. I wanted to catch up with Derek Yeomans and find out what life is like following his graduation from the WHL. Only problem was he wasn't home, so I talked to his mom. The Seattle Thunderbird/Kelowna Rockets goaltender is back in St. Albert Alberta after a season which saw him record 30 or more wins in three consecutive seasons. Yeomans will have a couple of month to decide on his next form of action. Does he get drafted by an NHL team in the June draft? You don't see many overage players selected but it is a possibility. Does he go the Canadian College route? He has all three of his sciences meaning he's no dummy. Or does he pursue pro hockey? My money is on the latter considering he has proven that he is good enough to play at a higher level which includes a earning a paycheck to play. Big Al Bristowe up in Prince George tells me games 3 and 4 are a sellout at the CN Centre. It's standing room only for those games, meaning the place will be rocking. Bristowe is the face of sports on PGTV up in Cougar country. I just got word that the Cougars and Giants will board the iron lung in the Western Conference Championships series which heats up Friday night. For those that didn't understand that first sentence, both teams will be using the bus as a means of transportation. Talk was the two teams would fly back and forth considering the distance between the two centers but chatting with Giants radio man Joe Kenward he was saying the two teams will only travel by air if a game seven is necessary in the series. How about the Calgary-Medicine Hat Eastern Conference final? Despite being only 3 hours apart, the two teams have decided to travel by air throughout the 7 games! Let's just say bus leg's won't be a factor in that one. I am going to take the Giants in 6 games because home ice advantage will be huge, and the Giants have it and the Cougars have to find a way of winning in Pacific Coliseum, a place they failed to win in this season. Do the Cougars care about home ice? Oh sure they would like to play all those games at C-N Centre especially after the crowd they got in game 6 Monday night, but the Cougars have won back-to-back series without home ice advantage and clearly have no pressure other than the pressure they put on themselves to win this series. The pressure is clearly on the Giants yet hasn't it been on them all season long? When it comes to goaltending if I matchup Cyr against Sexsmith, I like Cyr just a touch more because he has stolen some games in the playoffs for the Coug's. Yet the depth of the Giants on defense and at forward gives them the slight edge in every area other than goaltender. Cyr will have to be sensational - bottom line - for this to go the distance. I sure like the way the Cougars big gunners are playing right now, and if Setoguchi and Drazenovic play at an elite level the Cougars have enough fire power to make this a very interesting best of seven. I picked Calgary to advance against Brandon, and the Hitmen didn't let me down. Yet after two grueling series I just can't see them having success against a Tigers team which is just getting better. The Hitmen should be emotionally spent heading into the East final which is why I think the Tigers will win it in 5 games. Both teams will have to stay disciplined as the Tigers had the best power play in the league during the regular season while the Hitmen were an impressive 5th. For the record in the last round I picked three of the four winners, the exception being the Cougars beating out Everett. But was I close in predicting the length of the series? I want to apologize on this blog for what I thought was a lighthearted comment towards a colleague of mine. I've already apologized in a private e-mail but I wanted to come on this blog and admit my wrong doing considering the infraction happen in this medium. I won't name-names, but I want to apologize for what this individual though was an inappropriate remark from me towards him. I will admit I have a strange sense of humor at times (ok all of the time) and I thought the comment was a harmless jab, yet the printed word can sometimes be interpreted differently rather than verbally saying it with a sarcastic tone. I meant it as a light hearted joke, yet the person it was directed at didn't see it that way. I was told by a very wise pastor who married my wife and I that it doesn't matter how I feel about what I've done - and I can justify it in my own mind all I want - it's how the other person feels that counts. If I feel for that person and value them, I will consider their feelings whether I think they are right or wrong. I use that philosophy in my marriage and do the same in my friendships. In my mind I meant no harm to someone I respect and enjoy talking hockey with, yet feelings were hurt which I am sorry to see happen. I have indeed learned a lesson from this experience. Unrelated to hockey, the Dallas Mavericks came to Kelowna yesterday. OK, let me clarify in saying the Mavericks team jet came to Kelowna International Airport and I was on hand doing a news story for the radio station. A local company here in K-Town has a contract to do work on the inside of the Mavericks aircraft which includes gutting the cabin and adding leather seats, TVs everywhere, two bars, beds and two lounges. Even the ceiling will be raised 14 inches to accommodate the Mavericks players if they use the aircraft in the near future. This plane is a 767 which obviously isn't as big as a 747 but getting up close to it on the runway was amazing. I was told brand new, the aircraft is worth over a 100 million bucks. What the Mavericks are doing with this jet is using it for team flights but are also chartering flights for various v.i.p's. A similar jet that the Mav's are currently using was also refurbished by this Kelowna company and has chartered for the likes of Bruce Springsteen, The Rolling Stones and even the wedding party of Tom Cruise and Katie Holmes who were flow to Italy for the big ceremony. 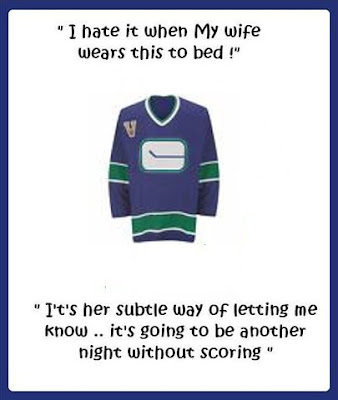 If I were to cheer for the Canucks it would be for only two reasons. Brent Sopel and Josh Green. I probably got to know Sopel the best when he was a young d-man with the Broncos in 1995. He was acquired from Saskatoon for goaltender Ian Gordon, and put up some impressive offensive numbers as a 18 and 19 year-old. What I remember about 'Soaps' was his squeaky voice and the time spent at his Mom and Dad's place for a post game meal. On two separate occasions after a game in Saskatoon - Sopel's home town - the entire team would board the bus and head to Sopel's place. They'd have tables and chairs set up everywhere in the house, and had neighbors cooking several dishes all afternoon which were ready and waiting piping hot for the boys to enjoy after the game. What an experience that was as the Sopel family loved to entertain in their home and liked nothing better than having all 28 of us - players, coaches, bus driver and radio guy eating a home cooked meal. I got to know Josh Green after one of the most lopsided deals I've ever seen. Broncos GM Todd McLellan somehow persuaded Tigers GM Doug Mosher to trade Green and Rocky Thompson to Swift Current for four players including current Blazers Assistant Andrew Milne. Even Milne will admit the Broncos won that deal. Green was golden for the Broncos and was a big part of the team in the last half of the 1996-97 season where he put up 25 points in 23 games before scoring 9 times in 10 games in the playoffs. 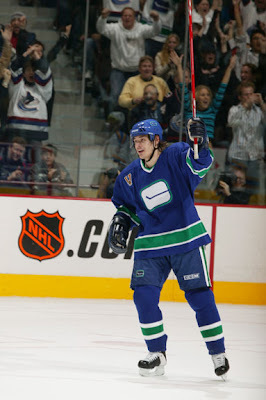 Green would eventually be traded to Portland but he had the ability to skate, pass and shoot which made you think he had a long NHL career ahead of him. Yet his best year in the 'bigs' was in 1999-2000 when he scored just 12 goals with the Islanders. ESPN Writer Bashes Broncos/Parker P.O'd? Sakic was no ordinary Joe! Play'n in the Pro's and Playoff Picks! The Series that Slipped Away - Part One!